Casa Collina price per day from CHF 180 . Rustico auf Burg price per day from CHF 140 This spacious apartment is located in the scenic village of Brione s/Minusio, 3 km from Locarno. It offers free Wi-Fi, a bathroom with a spa bath, a balcony, and a furnished terrace with deckchairs and barbecue facilities. Apartment Moderna Located on a slope above Minusio and a 5-minute drive from Lake Maggiore, Apartment Moderna offers a terrace with partial lake views, a fully equipped kitchen and free WiFi. A bus stop is located 50 metres away and the Verzasca River is a 15-minute drive away..
Garten Hotel Dellavalle price per day from € 69 Located on a sunny terrace above Locarno and surrounded by a 6,000 m² park, the Hotel Dellavalle offers a beautiful view of Lake Maggiore and a heated outdoor pool. 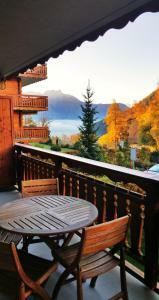 The family-run hotel is easily reachable from the Locarno train station by public transport. Casa Sibylle price per day from € 127 Set on a hillside and located a 5-minute drive from Minusio centre and Lake Maggiore, and 2 km from the Orselina Cable Car Station, Casa Sibylle offers free WiFi, a small balcony with lake views, a furnished terrace, and free private parking. The apartment at the Sibylle comes with a private bathroom with a shower, a TV with satellite channels and a well-equipped kitchenette..